Heysham II is a nuclear power station owned and operated by British Energy, and located just outside the port of Heysham. The plant’s two advanced gas-cooled reactors (AGRs) provide steam to two 660 MW steam turbines. Prior to privatization, British Energy was part of the Central Electricity Generating Board (CEGB), an organization with a worldwide reputation for excellence. The power station provides electricity to the high-voltage electricity transmission network for distribution throughout the UK. After many years of power generation, the conventional screening and filtering systems installed during the construction phase of Heysham II needed replacing due to their deteriorating performance. 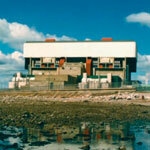 To improve reliability and availability, British Energy sought alternative solutions to the seawater filtration system used in the reactor cooling process. The original seawater filters at Heysham II were susceptible to clogging, and the service life of the original plant was coming to an end. Recognizing the need for increased availability and reliability, as well as reduced maintenance, the station staff investigated replacing the conventional basket filters with alternative filter types. 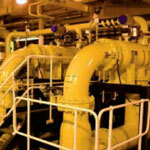 Following thorough investigation into the filters available, British Energy purchased Alfa Laval ALF filters for installation during the plant outages of 2001 and 2002. The Heysham plant’s seawater filtration system uses water from Morecambe Bay. However, the bay is relatively shallow and sandy, which means the filtration system has to remove sand as well as marine life and shell debris. The Alfa Laval ALF filters are located in the reactor containment building, mounted horizontally in the seawater piping system, after the coarse drum screen and ahead of the cooling water pumps. The filters effectively remove particulate down to 0.5 mm in size. The Alfa Laval ALF filters have improved both reliability and efficiency. The automatic flushing, based on a timer and pressure differential, ensures the filters are kept free of debris. Mike Craddock: “There is little doubt that we have seen a great improvement in efficiency since installing the Alfa Laval seawater filters”. ALF is a pressure filter with an automatic flushing arrangement. It has a filter casing made of stainless steel (ALF-S), glass fibre reinforced polyester (ALF-P) or rubber lined carbon steel (ALF-R). The internal cylindrical filter basket is made of stainless steel. Optional filter basket material qualities and mesh sizes can be selected. The filter is available for connections ranging from 100 to 600 mm and is designed for placement directly in the pipe system. This enables installation of the filter in almost any position. ALF has the inlet directly in line and the outlet at a 90° angle; it is therefore suitable for installation on any 90° angle bend in proximity to the equipment to be protected. This permits access to the filter basket without removing the connections. Automatic flushing is carried out at regular intervals without interrupting the filter process. The completely automatic flushing arrangement contains a flushing valve and a flow diverter which are regulated by a PLC in the control panel which can be mounted adjacent to the filter.